Heart is an excellent muscle to eat: it’s lean and flavorful (meaty but not organy—it’s a hard working muscle, not squishy spleen), it’s got a good bite, and it’s inexpensive (I bought the three-pound grass-fed beef heart for six bucks last Saturday). And one more thing: it puts to use a cut that is often thrown away; it’s important that we do our best to make use of all parts of the animals we kill for our food. I use a beef heart here, but you can use a veal heart which is a little more tender and mild. I first had beef heart a couple summers ago when Pardus visited. He stuck it on skewers, a good strategy because you invariably end up with different sized chunks after trimming. Last year, during Pardus’s visit, we ate at Lola, where then chef Derek Clayton did an appetizer pairing veal heart with fingerlings, a celery root puree, mushrooms and a salsa verde (he tried grinding heart scraps for family meal meatloaf; he recalls a very unhappy family that day). You could do a beef heart tartare (here’s a general tartare post or see the link below for Chris Cosentino’s beef heart tartare puttenesca), a beef heart stir-fry, add it to meat you’re grinding for burgers, cure it like corned beef, cover it with coriander and pepper and smoke it for beef heart pastrami. You name it. In her splendid new book coming, Odd Bits: How To Cook the Rest of the Animal, Jennifer McLagan notes that you can also braise the heart (the book’s out next month, highly recommend it). If you do, she rightly recommends leaving the exterior fat on. I don’t think I’ll ever braise the heart, though. It would turn the distinctive bite and flavor into run of the mill brisket-like beef. Stick to preparations that will feature it’s unique texture and flavor. Liberally salt the beef, add the shallot and oil, toss and refrigerate till youre ready to cook it (an hour is optimal, but for as long as 24 hours). Grill the beef over hot direct coals. Depending on your grill and how you’ve cut your meat, you may want to grill the pieces in a basket or put them onto water-soaked skewers. Grill to medium rare, 2 to 3 minutes per side. 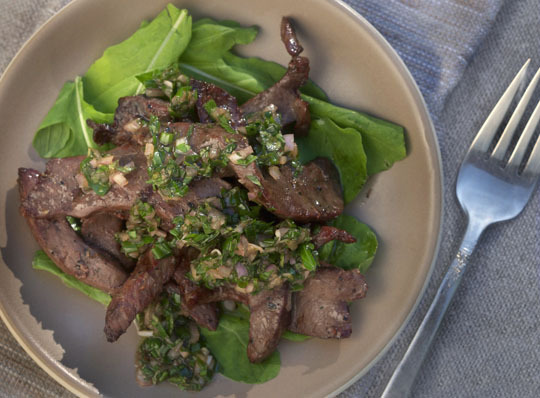 Arrange arugula on plates, top each with beef heart, and spoon the vinaigrette over the meat. My post liver crudo and Broken Arrow Ranch. Chef Chris Cosentino’s blog Offal Good shares information about cooking offal, kitchen life, and much more. Here’s his beef heart tartare. Daniel Okrent of Food & Wine Magazine writes about an organ meat eater’s club in his article Offal Truth. Yakitori Hatsu or grilled chicken hearts, the recipes is provided by Raymund of Anh Sarap. Cannot wait to try this! Thanks for sharing. I used to make a Syrian-style beef heart dish back in the 70’s. It’s typically cut into a small dice and sauteed in olive oil and diced onions – salt and pepper. It is served with a Arab-style soft flat bread (pita will do) along with fresh tomatoes and onions. The idea is to tear a small piece of bread and use it to scoop up some of the heart with additional pieces of tomato and onion nestled inside. It was very good. I really should try it again. I like the vinaigrette addition. I love making chili with different cuts! Must give this a try. I have found that grilled skirt steak, rough chopped, then into the chili pot is excellent & also an inexpensive cut. Looks good, I’m going to try it skewered. Other favorite ways to prepare beef heart are Beef heart Stew and Pickled beef Heart. i’ve been getting lamb hearts from my farmer’s market – brine it for a day, then just salt, pepper, and grill it real quick. simple and delicious. did lamb heart tacos not too long ago with red onion and mint, fantastic stuff. love heart meat! No!!!!! I JUST this week threw away the half of a beef heart that’s been in our freezer for 10 months. It was a little freezer-burned but this post has me wishing I’d kept it to try and salvage some. I did make some beef heart jerky (used your recipe, actually) and it turned out great. I have to disagree with you there, Michael. My great-grandmother used to prepare a beef heart dish that was braised, and it was to die for! I was only 9 years old, but I still remember how the heart tasted after a long, slow braise, then we ate it thinly sliced with a touch of freshly grated horseradish straight from my Grandfather’s garden. Granny used to let the remains cool in it’s own juices, and then we would welcome sandwiches of thinly sliced cold meat with hot mustard on crusty bread. glad to hear it, will rethink the beef heart braise. Looks delicious. The last time (also the first time) I prepared beef heart I brined it as per corned beef, braised it, sliced it and sandwiched it. A tasty albeit unadventurous intro to the magnificence of heart. Say, there seems to be something funny about the color in the lower-left hand quadrant of the plate the heart is on. Photoshop gone bad, perhaps? it’s shadow, shot in low evening sun. A few years ago, I acquired a beef heart and even though I am a Chef, I didn’t know exactly how to clean it. I contacted Chef Cosentino who was lovely and patient (I know!) and a great teacher. Okay, maybe not that patient — but lovely and a great teacher, nevertheless. He truly is the king of Offal. I have not tried his Beef Heart Tartare Puttanesca but I am sure it will be fabulous, as will your recipe. One last thing: “where then Chef Derek Clayton”… Where is Powder, the man who taught us how to deep fry bone marrow???? he and powder are one and the same. though he’s not CDC of lola, a position former pastry chef Cory Barrett took over last spring. I just saw beef heart and tongue at Meijer yesterday, so it’s funny you posted this today. I’m a little worried about the quality of heart coming into Meijer, though. Grew up in PA Dutch Country…pickled beef heart was a favorite, commonly found at the farmers markets. Didn’t you do this recipe on the no reservations technique episode? It’s hard to know where even to find heart nowadays, but it is very good. food. My old fashioned mother made it according to a recipe of my French paternal grandmother. It was cleaned, stuffed and then braised. We all loved it. In Italy where I live I only see it in slices, so the only experience I had had of it was useless. Thanks for a new road. I find heart a great ingredient in rice and whole grain dishes. I don’t cook it in though. I’ll cook something like wheat berries and brown rice with onions, thyme & stock; as the grains finish up, I saute diced heart in butter and toss them in so they don’t boil too long and get tough. Anyhow, nice post, we should eat more heart for sure, the taste of an average heart is better than many cuts sold at much higher prices, and I’ve never had tough heart unless it was overcooked in liquid. It’s sad to think that most are wasted and used in by-products. As for a braise of beef heart, I think you might be mistaken about the final texture. It will still be distinctive because heart has another type of connective tissue other than collagen that does not completely dissolve into gelatin and remains “tough”. so it might be worth checking out. My mother used to pickle both sliced heart and tongue. Pickling spices and a vinegar brine with a bit of sugar to cut the sharpness. Poach the sliced heart and then store in the fridge covered with the brine. Great snack food but I can never get my friends to try it because they eat with their minds rather than their taste buds. I love pickled beef or venison heart. Beef heart was one of my favorite dishes when I was young – I even requested it for my birthday. My mother used to bake a heart in the oven in canned beef broth for three hours. I expanded the recipe to include a lot of tomatoes and diced celery, and served this to my own family for years. Now I’d like to try some of the ideas I’m finding here. Thanks to all! Waiting for a similar post on beef tongue. My mom made it infrequently when we were kids and now she says she does not remember how she prepared it. I remember enjoying the beefy flavor, but a more pleasing texture than the chewiness of some cuts. Michael, I appreciate the concept of “Head to Tail” eating, (love Fergus Henderson), but I think that you’re being a bit disingenuous when you say that these cuts are often “thrown away”. In the world of factory farming, virtually all of the animal is processed; the hearts are certainly going into (best case scenario) pet food, but more likely into processed meats….bologna, wieners, “lunch meat”, and so forth. The heart would be one of the most useful bits for those of us who like to feed our pets protein-rich foods. Do those who raise artisanal “grass-fed beef” routinely throw out the beef hearts? I think not. Why on earth would they? And although I respect those who eat organ meats, I don’t go there for reasons of taste. To subtly ‘guilt’ people into eating these bits that will never be wasted is a bit tacky, methinks. Is it yummy? Eat it. Is it virtuous? No. Is it going to be thrown out, thus lessening the sacrifice of the critter? Of course not. i certainly don’t mean to guilt anyone into doing anything and am sorry that I conveyed this. Hi Michael, thanks for showing how to clean the heart. I’m a little uncertain about whether or not to trim off the thin shiny covering on the outside of the heart? Can you clarify this for me? Thank you! I’m going to make this for a party this weekend. Sneak in some beef heart muscle for a taco party! I’ve never cooked it before…I wonder if people will notice?? I’m still going to dress it in the vinegarette too…seems like a nice addition for make your own tacos. Do you think Fosters will have beef hearts on Weds? Sometimes they only bring out these cuts on Saturdays at the market. We used to use coarsely ground beef heart in the “diet taco salad” when I worked at a little deli. It was cooked and seasoned exactly the same way as our regular taco salad, the only other differences were that it had no tortilla chips, half as much cheese and no sour cream. It was dressed with a pureed pico de gallo that had a bit of vinegar and olive oil added. It was finished with a dollop of guacamole, as I recall. So sorry if this question is a repeat….looks like my original posting might have got deleted? Chris Cosentino has a good video on cleaning a beef heart…. So, you finally got a Big Green Egg, huh? How do you like it? Cooked low and slow on it yet? Bread? Pizza? Lamb hearts are amazing too! Please write more offal posts. Not enough information on how to prepare these great cuts! My father-in-law just got back from an elk hunt in Colorado and I put in a request for the heart if he was lucky enough to take one… and he did. It’s packaged in two pieces so for the first one I’m thinking tacos… Seasoned and grilled elk heart, diced onion, cilantro and queso fresco. I’ll let you know how it goes. Thanks for the video! Thanks for the video! It was very informative. If I’m grilling (or really any type of cooking), what temp should the heart reach so I know its safe to eat? Would this temp be the same for chicken hearts as well? I’m always looking for new, cheap ways to eat (especially protein packed).